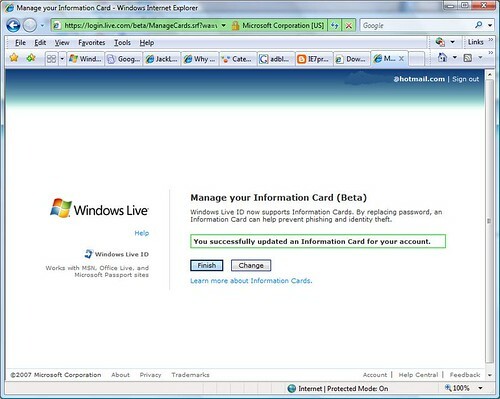 Interesting, I noticed today that you can now log into Windows Live sites (and all sites which accept Live ID credentials ) using an Information Card. This is in Beta currently. This could be a major step forward in federated identity. However, it only works on IE7 with .NET Framework 3.0 for now – hopefully that bug will be fixed soon. Are Microsoft at the Web 2.0 races? I have been asked to give a presentation, on Microsoft’s relevance in the Web 2.0 arena. What do people think, are Microsoft a player in this sphere? They have Office Live, Windows Live Mail, MSN Spaces and they are a big supporter of RSS – it will be baked into the next versions of Internet Explorer (IE7), Office and Windows Vista. Hell, Microsoft even have Atlas, a free framework for developing Ajaxy Web 2.0 applications! Some sites use RSS icons. Most that I visit use the orange XML icon. But other sites donâ€™t have any icon and instead use words like â€œsubscribeâ€? or â€œfeedâ€? or â€œweb feed.â€? There’s a great discussion in the comments of Robert’s post on this issue – with some making the point that auto-discovery in IE7 will solve the problem and others countering that if you want to add the feed to an online reader like Google Reader or Netvibes, then autodiscovery won’t resolve that problem. We had a very fruitful discussion on that topic here a few weeks back, after Dave Winer suggested that we use a Subscribe button. What we came up with was a combination of an orange Subscribe button and a Help button – thanks to FrankP‘s generosity these buttons and the Help text are free to copy and use on other sites.